It's my first post here. I am an engineer in electronics with a strong background into radio-electricity and musical electronics (from vacuum tubes to DSP). But for now and I hope for good, I am converting into an artist, playing guitar and singing, also playing theater (music and acting have a lot in common, especially with the voice, the rythm and the respiration, and complement each other very well), and electronics is a hobby. I always prefered the tubes over the transistors because they are at the border of electromagnetism and electronics, which make them more flexible than transistors. From a few weeks ago, I am slowly converting an old philips vacuum tubes radio into a theremin. That radio is of outstanding quality, a swedish model which include a lot of good quality parts and some rare to find parts like adjustable capacitors with negative temperature coefficient. As the original box is quite large and I don't want it in my way when playing, I want to be able to separate the antennas from the device. It is why I choose to use the Clapp oscillator for both the volume and the pitch. This have the added advantage, as the whole LC is with the antenna and is at DC ground potential, that no coupling coil, transformer or capacitor is needed between the antenna and the LC. 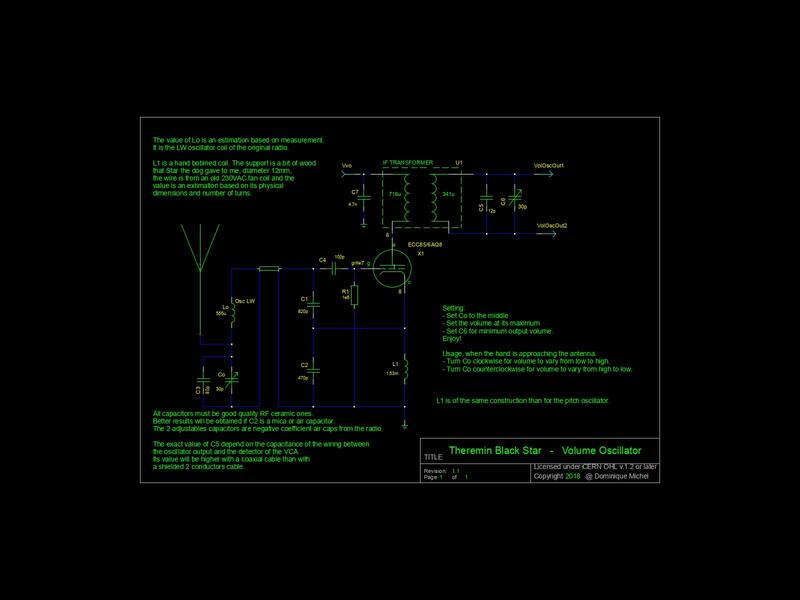 I will publish the schematics and pictures when I am done. What's working for now is the audio part and the 3 oscillators. I made some tests, the volume seem to work very well, and I can set it in both directions (from low to loud or from loud to low). The pitch seam also to work very well from the infrasounds to the ultrasounds. I still have some work to do, like regulated supplies for the oscillators, a new front plate with all the needed/wanted controls and plugs, some kind of illumination on the front plate, and a rearrangement of the electronic stages in order to get an active separation between the volume and the pitch oscillators. The audio output is made with an EL84 and have an output transformer of outstanding quality, which already give me better sounds with my electrical guitar than my fender champ. That imply I want to be able to also use it as guitar amplifier. - What is the voltage amplitude on the antennas for the existing devices? - Supposing we have a stable and good working electronics. In order to get a good working and well playable musical instrument, what accessible controls are mandatory or recommended? Those with coils in series with the antenna often have hundreds of volts peak-to-peak at the antenna. FredM reported that anything over 50Vp-p was probably fine to swamp external interferers. "Supposing we have a stable and good working electronics. In order to get a good working and well playable musical instrument, what accessible controls are mandatory or recommended?" - Audio brightness & wave shaping controls. I've found a deliberately introduced non-linear "break point" in the volume field response to be quite useful. This goes from quiet to audible over a small range, with expanded and therefore finer control over the medium to loud range. They must be good devices to make interferences on the MW radio band. This is what I have for the pitch oscillator, but I am a little bit low for the volume. But anyway, their optimisation is not completely done. I didn't think about that, I will add one. "- Audio brightness & wave shaping controls." I have bass and treble controls. What do you mean by wave shaping controls? I will add an effect send and return in the audio path. At some point, I will also have enough gain to saturate the audio preamp as with a guitar amplifier, this will give some kind of fuzz sound. "I've found a deliberately introduced non-linear "break point" in the volume field response to be quite useful. This goes from quiet to audible over a small range, with expanded and therefore finer control over the medium to loud range." Not sure if I understand right. The volume circuit is similar to an AGC into an AM radio. You get a DC voltage which is proportional to the amplitude of the signal, and into a theremin, you have an added filter that will convert frequency variations to amplitude variations. Into a radio, you can have several curves of sensibility for the AGC. With the most simpler controls, the AGC voltage will be proportional to the antenna's voltage, when with amplified controls similar to the volume control of a theremin, the AGC voltage will vary much faster when the input signal is low than when it is high. But maybe you are talking about the electromagnetic field of the volume antenna. which imply I may have to introduce some coil in serie with that antenna at some point. I was thinking this will linearize the volume response. similar to the volume control of a theremin, the AGC voltage will vary much faster when the input signal is low than when it is high. - When set to increase the volume when the hand is approaching the antenna, the control voltage get from higher to lower with the hand approaching. - When set to decrease the volume when the hand is approaching the antenna, the voltage will get from lower to higher, which will result into slower volume changes when the hand is near the antenna than with the first setup. I didn't get the time to measure that, but it is an hearable difference between these 2 setups. 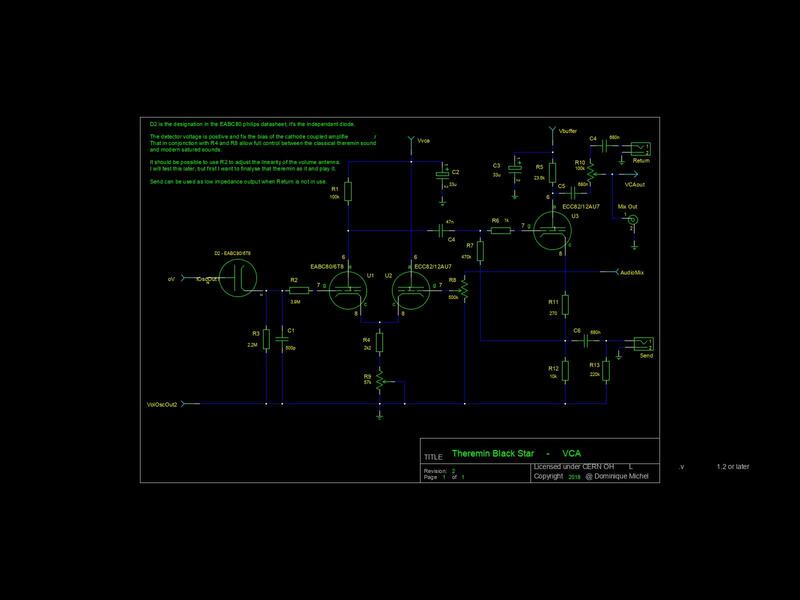 Maybe it will change because I will change the active part of that circuit in order to get an active separation between volume and pitch. Probably, though the antenna is small in proportion to the wavelength, so it is inefficient at coupling energy to the "ether". "I have bass and treble controls. What do you mean by wave shaping controls?" Some way to distort the waveform to give various pleasant timbres. If your final audio wave is a sine you might try half or full wave rectifying it to give a more vocal sound. Various filters afterward help a lot too, you can get a fairly realistic human vocal sound with just 3 band pass filters. "Not sure if I understand right. The volume circuit is similar to an AGC into an AM radio. You get a DC voltage which is proportional to the amplitude of the signal, and into a theremin, you have an added filter that will convert frequency variations to amplitude variations." I'm talking about intentional non-linear hand movement / volume response. I think the best volume response is to go from zero volume to low/medium volume over a small hand movement range, and go from low/medium volume to maximum volume over a somewhat larger hand movement range. Maybe a 3:1 "gain" range here, with the entire range covered in ~20cm. "I didn't get the time to measure that, but it is an hearable difference between these 2 setups." That's probably because, as on the pitch side, you're using the implicit exponentiation of the response (that is, using the signal exponentially, because our ears hear volume and pitch logarithmically) as well as the non-linearity of the volume side resonance curve. There's a lot of math going on that isn't obvious. "I'm talking about intentional non-linear hand movement / volume response. I think the best volume response is to go from zero volume to low/medium volume over a small hand movement range, and go from low/medium volume to maximum volume over a somewhat larger hand movement range. Maybe a 3:1 "gain" range here, with the entire range covered in ~20cm." "That's probably because, as on the pitch side, you're using the implicit exponentiation of the response (that is, using the signal exponentially, because our ears hear volume and pitch logarithmically) as well as the non-linearity of the volume side resonance curve. There's a lot of math going on that isn't obvious. I have to decompose that curve into individual phenomenons and look where I can influence it to get what I want. From that discussion, it would be nice if I can implement knee and sensibility controls for the volume. Just to say I get something that work relatively well enough to begin to optimize each block of the circuit. Until now, the most time consuming work was on the supplies and the ground paths. More later. 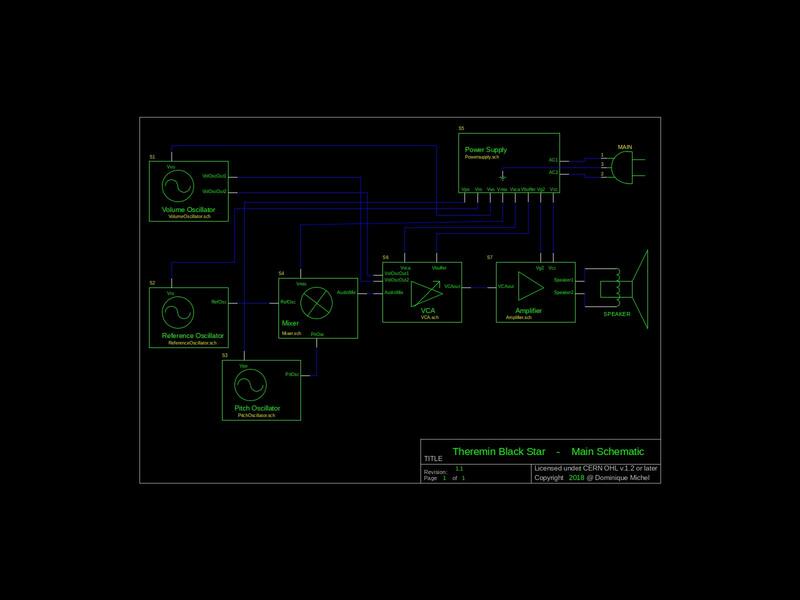 I made a github repository with all the schematics: Black Star Theremin. I named the Black Star theremin because a good friend have a very funny black border collie named Star. The 2 other oscillator have the same topology, but with EF89 tubes mounted in triodes. The reference oscillator have a higher Ua and a bipassed cathode resistor in order to get more RF amplitude into the mixer.